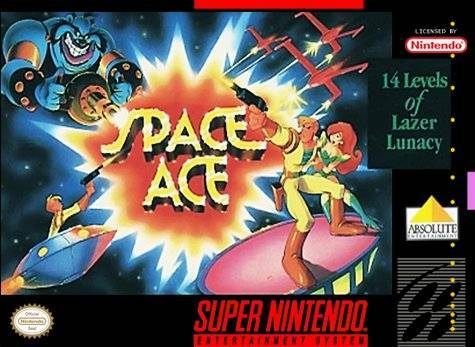 Space Ace for Super Nintendo allows you to be responsible for keeping the peace throughout the galaxy but Commander Borf nails you with his Infanto Ray turning you into a little kid! On top of that, Borf has kidnapped your girl, Kimmy, and he's threatening to invade Earth. All you have to do is eliminate Borf, rescue Kimmy, save the Earth, and find a way to get back to your adult self. Through 14 levels of intense space-fighting action, you'll face off against some of the weirdest enemies you've ever seen.